ArabSaga: Russia's Syria policy seen "sitting at a bar"
Save for Syria, the hodgepodge of news and views I came across this morning while going through the Arab media includes Qatar’s trailblazing diplomacy, which knows no bounds. Qatari Crown Prince Sheikh Hamad Bin Tamim al-Thani yesterday succeeded in brokering ice-breaking talks in Amman between Jordan’s King Abdullah and Khaled Meshaal, political leader of the Palestinian Islamist movement Hamas. It was the latter’s first visit to Jordan since he was expelled from the country in 1999. Meshaal, who has since been based in Damascus, flew in to Amman on the Qatari crown prince’s private jet from Doha. On Syria, rhubarbs have now broken out among news reporters about the state of play in Damascus. 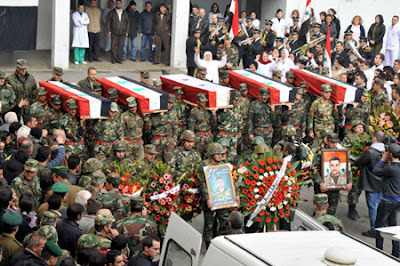 Among other news, they highlight a mass funeral for 23 army and “public order” men killed by “treacherous terrorist hands,” the assassination by “armed gangs” of Homs-based agriculture engineer Ms Amal Issa, the theft of 17 government vehicles from a garage in Idlib, and the quasi-licensing by the interior ministry of two new political parties. Wondering how best to save Syria, Abdul Rahman al-Rashed, Saudi boss of Alarabiya TV, says: “A political stand by the Arab League forsaking the regime would entice everyone to pounce on it. An assortment of forces would embrace the main Syrian opposition as the legitimate representative. “What the Arab League is doing today is cover up the regime’s ugly crimes. As several Syrian opposition figures demanded, the Arab League needs to take off the hand it clasped around the Syrian people’s throat. Syria remains the most important buyer of Russian arms. Russian arms are paid for either in Syrian cash or Iranian oil. Syria’s Tartus naval base gives the Russian Navy a strategic foothold on the Mediterranean coast. Syria’s Intelligence tentacles in the region feed the Russian spying services. Private Russian oil companies expect Syrian pressure on Beirut to win them Lebanese government contracts to explore for oil and gas off the Lebanese coastline. “This is not to say the Arab League should not be knocking at Moscow’s door to win Russian support for the UN Syria resolution.” Russia is eager to jump to bed with Washington and the Arab world, but only if the Syria price is right.